Breakfast is the most important meal of the day; who am I to skip any opportunity to eat (especially if it’s key to my day starting off on the right foot)? Usually, I have a big bowl of cereal in the morning but every now and then I treat myself to something special. Breakfast sandwiches never fail me and a hot bowl of oatmeal with brown sugar can hold me over until my next meal of the day. There’s one sweet treat that I indulge in very rarely, only because its addictive properties may do more harm than good in the end. Gia Pronto, a locally owned sandwich and salad spot in University City, serves an apple-cherry-walnut bagel in the morning hours of their operation. Laced with swirls of brown sugar, the bagel is reheated on a Panini press, resulting in a warm confection with an exterior as sticky as a cinnamon bun. Don’t expect to get one if you show up past 10 AM, though: these things sell like hotcakes. To recreate similar flavors at home, I opted for a real-deal dessert that can (and should be) eaten breakfast, lunch and dinner. Preheat oven to 350 degrees, Fahrenheit and grease cookie sheet. With an electric hand mixer, mix together butter, ½ cup brown sugar, honey, egg and water thoroughly. 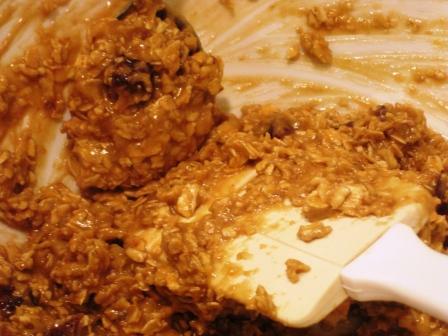 In a separate bowl, sift together dry ingredients, and then stir in oats. Add dry ingredients to honey mixture and mix. 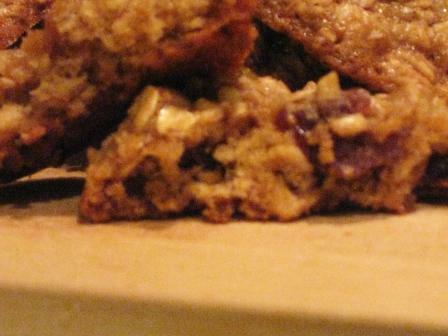 In a small bowl, mix together cherries, walnuts and 1 teaspoon brown sugar. Fold into cookie batter. Drop by heaping teaspoons onto cookie sheet and bake for about 14 minutes. Cool on a wire rack. 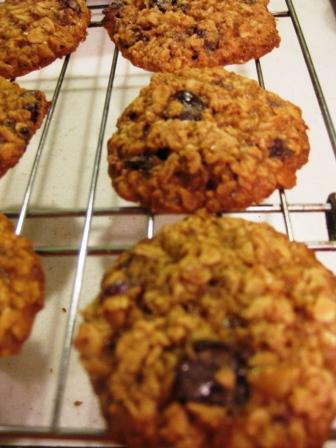 With very little flour, and plenty of honey and brown sugar, this cookie is chewier than a typical oatmeal cookie. It’s evident even as all of the dry ingredients are added to the sticky-sugary wet mixture; the batter is on the runny side, giving the impression that the heating it in the oven would result in a gooey mess. The cookies do spread out quite a bit on the pan (make sure you leave about 2 inches between each when dropping then onto the pan), but at a certain point they cease melting and firm up, just enough to give you a soft, chewy treat. These cookies serve as way more than just a stand-in for Gia Pronto’s in-demand bagel; they go great with a piping hot cup of coffee, sweeten up lunch at my desk, and are satisfying as a late-night snack. Even better, they’re available on a more frequent basis.